Yesterday I saw the current Broadway production of The 39 Steps. 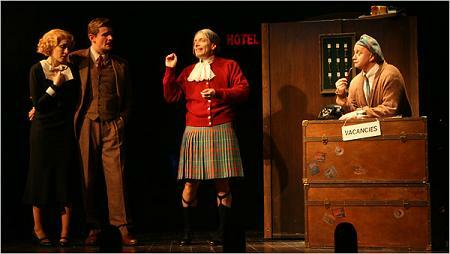 The play faithfully follows the plot of Hitchcock’s film, scene for scene, but turns it into a wild (and very funny) farce. What was particularly interesting to me was that all of the humor on-stage was based on playing with Theory of Mind. I’ll explain. The basic strategy of the play is to point out, right from the start, that we are watching an artifice, a thing of pure unreality. Which of course is a given, since we’re actually watching a play – mere actors on a stage. But here the artifice is ratcheted up further by the fact that the several dozen characters from the film are played by only four actors, who continually swap in and out of costumes and personalities. At times actors switch costumes so rapidly that they are able to have entire extended dialogs with themselves. Please understand, this is all done very well, a feat which requires split-second timing, instant shifts of acting technique and razor sharp choreography of movement. The cast is more than up to the job. Of course the real subject of the play is not Hitchcock’s The 39 Steps. That is merely a McGuffin. The play is really a comic essay about the phenomenon of theatre itself. Specifically, the contradictions of an art form predicated on spending one’s evening watching real people pretend to be imaginary people. As I watched the actors shift in and out of the “reality” of the story, I realized that at its core I was witnessing the power of Theory of Mind. The audience’s ToM is being given a continual workout, by being asked to join the cast in the wild exercise of constructing ephemeral views of mental states and emotional relationships, while the quotation marks that serve to nest those views within one another are continually put on and taken off. The humor comes from seeing the world of theatrical emotion continually deconstructed. And the audience never tires of the joke, even though in some places it is repeated multiple times in literally the same way. At the performance I attended, the audience laughed, on cue, every time, no matter how many times they had already seen the same trick. My favorite moment came near the end of the play when a character – the arch villian – becomes enraged to see his fiendish plot foiled by an event so meta-, so outside the reality of his character, or even of the play itself, that the moment is as absurd as watching a sock puppet jump off a performer’s hand to rail against the sock manufacturing industry. Now you must understand that the actor who is playing this particular moment has just slipped into the arch-villian character mere seconds ago. In the last several minutes alone we have probably seen him play about ten wildly different characters, including several women. And yet the audience recognizes and responds enthusiastically to the frustration of the arch-villian, this sock puppet, this utterly transitory being. The playwrite understands perfectly that we, the audience, will embrace any dramatic being that makes a heartfelt claim on our emotions, no matter how absurd that being may seem. And to me that shows, right there, the enormous power of Theory of Mind in fiction. This entry was posted on Monday, March 24th, 2008 at 8:16 pm	and is filed under Uncategorized. You can follow any responses to this entry through the RSS 2.0 feed. You can leave a response, or trackback from your own site.